My first post of 2010 is both good and slightly unfortunate. 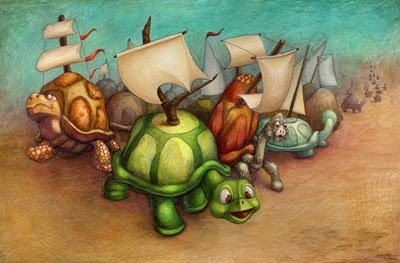 Good because you get a finished artwork post; slightly unfortunate because this is the fleeting turtles illustration that I entered in the SILA Illustration West competition...it didn't get chosen. Oh well...I plan on doing better next year and hopefully enter multiple pieces. I think that will definitely help me increase my chances of getting a piece of work into the competition. I still may enter it into the Communication Arts illustration competition, but i'm not 100% sure i'm going to submit...the deadline is in just a few days. I feel that I've improved 10-fold over the first SILA submission I entered in a few years back and I'm hopeful that my future entries will show as much or more improvement from the current piece. It probably also didn't help that I was entering into the unpublished category, which is the category with the most entries and the largest range of styles. I can't help thinking that I really need to get some artwork published, even if it is for a small publication. I got a really awesome gift from one of my friends this year: Do it Later! A 2010 Planner (or Non-Planner) for the Creative Procrastinator. I'm excited to see if I can fill it up or use it to motivate me and keep me going strong with all my plans for the year...including of course keeping everyone entertained by my sketches/doodles/artwork :) It's going to sit right on my desk and glare at me whenever I'm sitting there, asking me why I'm writing on my blog rather than working on art... hmmm... i should go.